Daughter and I enjoyed staring at Fatsopillar and taking pictures of him (yes, we think its a boy). 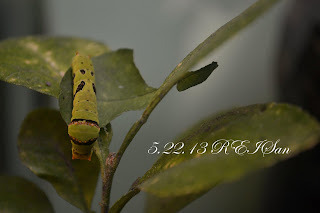 I guess he's been one of the most photographed caterpillar model. However, after finishing off the other leaf earlier, I decided to move him to a new calamansi plant, even if I know he will devour all of the leaves. I did try to place him in another leaf (ornamental plant) but he just smelled it and looked sad. I also gave him lagundi leaf, but still--- isnab nya! Oh wells, there goes my calamansi plants. Actually, the plant will still live, sans leaves for maybe a few weeks until new ones can grow. And I hope that by that time, Fatsopillar will have morphed into a beautiful butterfly. And because of the eventually that Fatsopillar will turn into a butterfly someday soon, I asked daughter to read---- Hope For The Flowers by Trina Paulus. Its a very nice book. I remember my mother reading that book to me every night and then we would be talking about Stripe and Yellow.